This syndrome of older Pugs doesn’t have an official name and little is known about how or why Pugs get it. 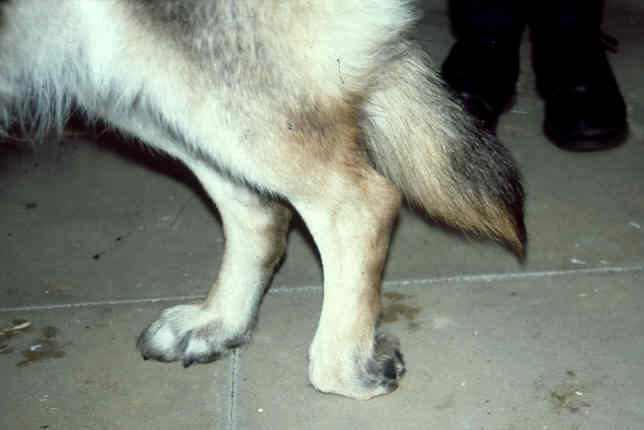 Owners of affected dogs may notice their Pug dragging his back toes, staggering in the rear quarters, and having trouble jumping up or down. The back sometimes gets progressively more arched and the dog may become incontinent. 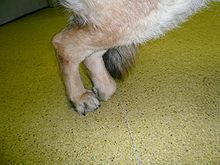 The dogs don’t appear to be painful and they often get worse very slowly. Often, the front half of the dog is still in good shape and is strong and some of these dogs can do well with a special cart for their rear halves. Anti-inflammatory medications don’t seem to change the course of the progressive weakness. Luckily, Pugs are portable, easy to pick up and easy to pick up after, so owners can often help maintain a good quality of life for these dogs.